George H.W. 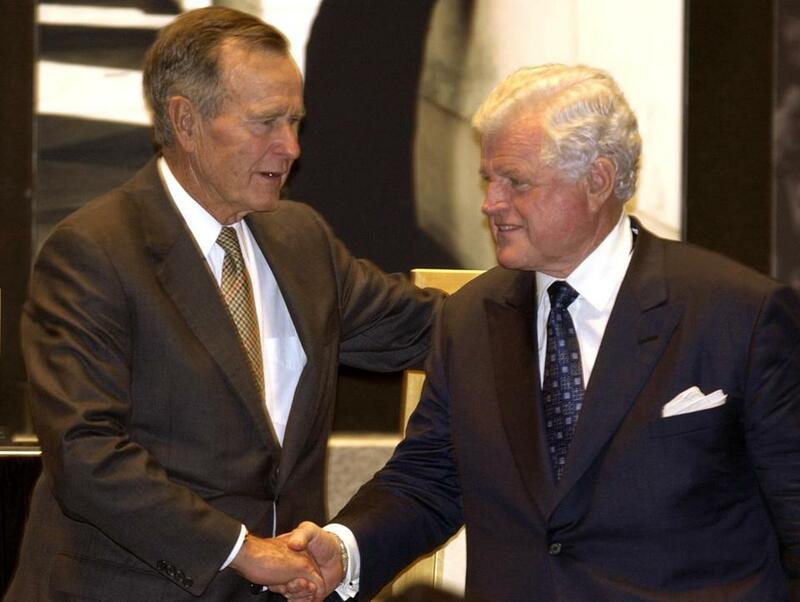 Bush shook hands with Senator Edward M. Kennedy in 2003 during an event in College Station, Texas. WASHINGTON — It was 2003, and George H.W. Bush brought Senator Edward M. Kennedy, a vocal critic of his son’s presidency and the war in Iraq, to Texas A&M — which was generally considered hostile Republican territory — and introduced him onstage. “It’s a well-known fact of life, particularly here in Texas, that when you want to fire up a Republican crowd, give ’em a little red meat, you know, nothing works like jumping on Ted Kennedy,” Bush said, his eyes twinkling. He had not, of course, invited Kennedy to Texas to make fun of him, but to praise the senator’s “steadfast public service” and present him with an award that bore Bush’s own name and came with a $20,000 check. “Heavens, the civility of it all,” read one newspaper story previewing the event. It was the kind of genial interaction that was a bedrock of the political style of the nation’s 41st president, who died on Friday at the age of 94. In the years since his presidency ended, Bush has been looked back on as a figure of civility and a model of gentlemanly public service that has, in some ways, been abandoned, especially when contrasted with the discordant and disruptive style of President Trump. The former president will lie in state in the Capitol Rotunda next week. “He didn’t lead inviting tribalism; he led inviting common goals,” said Andy Card, who served as his assistant and deputy chief of staff, and later became George W. Bush’s chief of staff. But the elder Bush’s record is nuanced. A long-serving political figure, Bush was also a committed partisan who steered the Republican National Committee after the Watergate break-in and waded into vitriolic politics when he needed to, as in his fierce 1988 presidential campaign against the Massachusetts governor, Michael Dukakis. Bush is set to lie in state in the Capitol Rotunda this week. In a proclamation on Saturday, Trump praised Bush’s humility and commitment to public service. “America, he rightly told us, is illuminated by ‘a thousand points of light,’ ” Trump said, referencing a speech by Bush about the importance of volunteerism and community groups that the current president had mocked at a rally earlier this summer. 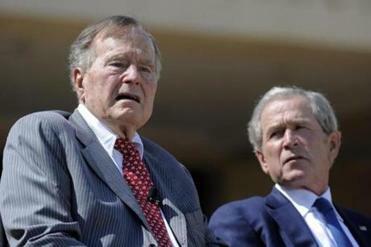 The two sharply disagreed in their visions for the country, their party, and civil discourse; Bush is said to have voted for Hillary Clinton over Trump during the 2016 election. Bush was born in 1924 in Milton, Mass. — “We’ve always been happy to claim him as a native son,” Kennedy quipped at that Texas awards ceremony — to Prescott Bush, an investment banker who became a senator for Connecticut, and Dorothy Walker Bush. He grew up in a genteel world of private schools, like Phillips Academy Andover and Yale, and summers at the family compound in Maine. “He really did carry a lot of his mother’s manners with him in life, and that included writing notes to people,” said David Sparks, who worked on Bush’s unsuccessful campaign in the 1980 presidential primary and on his 1988 campaign. Bush enlisted in the Navy during World War II and worked in the oil business in Texas before he was elected to Congress in 1966. He became an ambassador to the United Nations and, as head of the Republican National Committee, defended former president Richard Nixon during the throes of the Watergate scandal, although he eventually concluded Nixon had acted immorally. Bush later served as envoy to China and the director of the CIA. As president, Bush’s well-rounded resume served him well as he marshaled an international coalition that pushed the Iraqi army out of Kuwait. On Saturday, many international figures praised Bush — and a foreign policy that now seems dated, more restrained than his son’s and less jingoistic than Trump’s. After the Berlin Wall came down, former aides said, Bush was adamant that the United States tread carefully. “All the press wanted Bush to be standing on the wall and cheering, but Bush knew that [Mikhail] Gorbachev was in a precarious position, the hard-liners would use any aggressive cheering by the US as an insult to mother Russia,” said John Sununu, a chief of staff to Bush, referring to the leader of the Soviet Union as it collapsed. In domestic politics, Bush could be strategic and sharp-elbowed. He shifted his position on abortion to the right over time, becoming vice president under Ronald Reagan in 1980, and held that position as he ascended to the presidency for one term beginning in 1988. During his 1988 campaign, Bush benefited from operatives including Lee Atwater, and they dismantled Dukakis’s effort with ceaseless attacks, including racially charged rhetoric and an ad that featured the case of a black man, Willie Horton, who raped a white woman while on a furlough from prison while Dukakis was governor. According to John Sasso, Dukakis’s campaign manager, Bush was as cordial as ever in person. “In the midst of all the tension that was going on and all the bare-knuckled stuff, he always had time to be civil, to say hello, to ask how the Sox were doing,” Sasso said. As president, Bush visited regularly with elected officials from both parties, drawing on the connections he had forged in Congress and through his many years in politics. “He got more done in the raquetball courts of Congress than anyplace else,” said Ron Kaufman, Bush’s political director. Bush tried to make inroads on his side of the aisle, too. In 1989, as a hard-line Republican named Newt Gingrich ascended House Republican leadership ranks, Kaufman said, Bush invited him to his office and expressed concern that Gingrich’s “idealism” could get in the way of good governing. “It’s a way of looking at someone and saying, ‘Listen, we have to work together,’ ” Kaufman said. Bush’s dealmaking came with political consequences, like when he forged an agreement with Democrats that involved raising taxes — and thus reneged on his famous campaign pledge, “Read my lips: No new taxes” — in an effort to reduce the budget deficit. “He said to us, ‘Well, there goes my second term,’ ” Kaufman said. Indeed, Gingrich was incensed, and the backlash to the bill is seen as paving the way for Bush’s election loss and for the conservative uprising that would follow in the House. “(The conservatives) rose to power on their anger, and blaming him or attacking him, and in effect using him as a way to attack the moderate wing of the party,” said political analyst David Gergen, who was an adviser to Bush in 1980 and later advised Bill Clinton. After Bush lost the election to Clinton in 1992, Kaufman said, he invited Dana Carvey, who had famously impersonated Bush on “Saturday Night Live,” to the White House to spoof him and lift his staff’s spirits. “The message was, get over it — we had our run, we did the best we could do, and now it’s someone else’s turn,” Kaufman said. And when Clinton arrived in the White House, he found a note on his desk — just one of the thousands Bush had written over the course of his career.